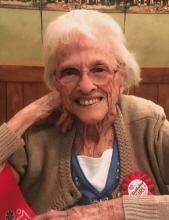 Virginia Perkins LaFaber, 97, of Beallsville, Ohio died Tuesday, December 4, 2018 in Astoria Place of Barnesville. She was born Thursday, September 8, 1921 near Alledonia, Ohio, a daughter of the late Charles and Nora Beckett Perkins. Virginia was a homemaker, a wonderful wife, a mother, a grandmother, a great-grandmother, and a great great-grandmother. She was a Christian by faith, a Charter Member of Beallsville American Legion Auxiliary #768, and a member of Pythian Sisters Chapter #593, where she served as Secretary for several years. In addition to her parents, Virginia was preceded in death by her husband, Myles O. LaFaber in 1986; a granddaughter, Valerie LaFaber; a sister, Edna Burkhart; and a brother, James Perkins. Surviving are four sons, Denzil (Jane) LaFaber of Bluffton, South Carolina, Donald (Dee) LaFaber of Martinsburg, West Virginia, Blaine (Linda) LaFaber and Wayne LaFaber both of Columbus, Ohio; one daughter, Juanita (Jim) Hamilton of Barnesville, Ohio; seven grandchildren, Darrell, Adam, Matt, Josh, Heath, Jenny, and Amanda; several great-grandchildren and great great-grandchildren; two special friends, Deb Wain and David Fawcett; many cousins, nieces, nephews, and friends. Visitation will be Friday, December 7 from 2pm to 4pm and 6pm to 8pm at the Harper Funeral Home, Beallsville where funeral services will be held Saturday, December 8 at 1pm with Gus Andrews officiating. Burial follows in Beallsville Cemetery. In lieu of flowers, memorial contributions may be made to Cancer Gas Cards, Inc., c/o Shirley Brown, 48397 Keylor Hill Road, Woodsfield, Ohio 43793 or to the Belmont County "Meals on Wheels" Program, c/o Senior Services of Belmont County, 67650 Oakview Drive, St. Clairsville, Ohio 43950. To plant a tree in memory of Virginia L. LaFaber, please visit our Tribute Store. Belmont County Senior Services "Meals on Wheels"
"Email Address" would like to share the life celebration of Virginia L. LaFaber. Click on the "link" to go to share a favorite memory or leave a condolence message for the family.